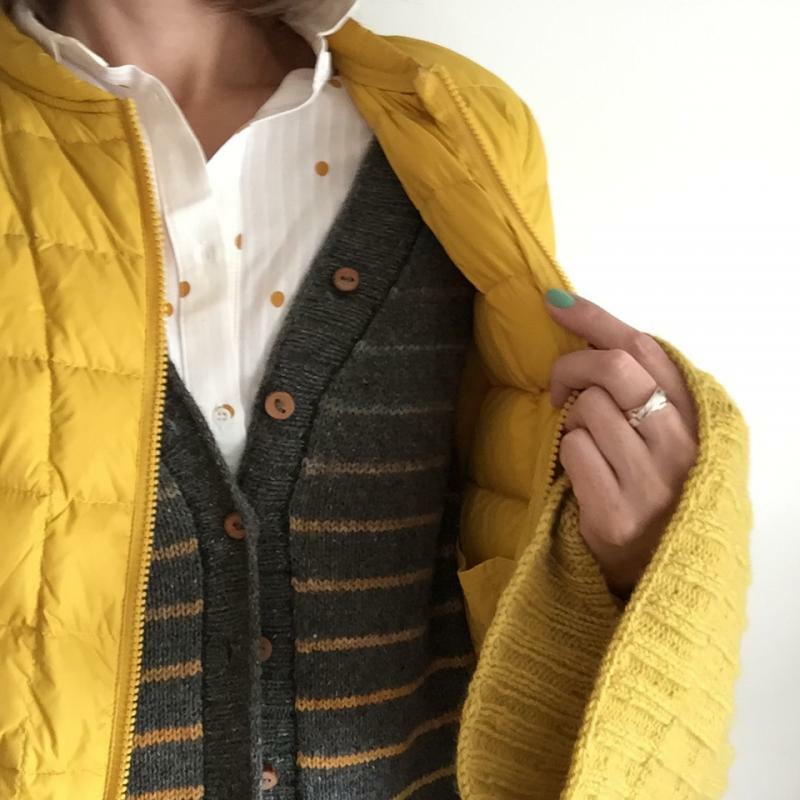 Unique to Knitche is our Pop-Up Boutique of products from independent local and regional artisans, including hand-dyers, hand spinners, and apparel and accessory designers. We have carefully curated a collection of high-quality and sought-after products, most of which are small batch or one-of-a-kind items and many, previously not available in stores. Each month we showcase a new vendor's unique wares, which is available for purchase that month only, before something new arrives! Kayanna began dabbling in yarn dyeing around 2013 and decided to make a serious go of it in the summer of 2018 as a full-time dye studio. A truly small family business, dyeing yarn in a garage, they are dedicated to making sure your yarn is the raddest out there. Color is their jam! Each skein is like an individual painting, they're speckled, splashed and soaked in super bright, beautiful colors. They only use professional, high quality acid dyes and food grade citric acid on their yarns. After a super long steam to set the color they allow the yarn to gently cool down, then rinse, rinse and rinse again. Finally the yarn is soaked in handmade wool wash making it super soft, clean and ready for you to squish. 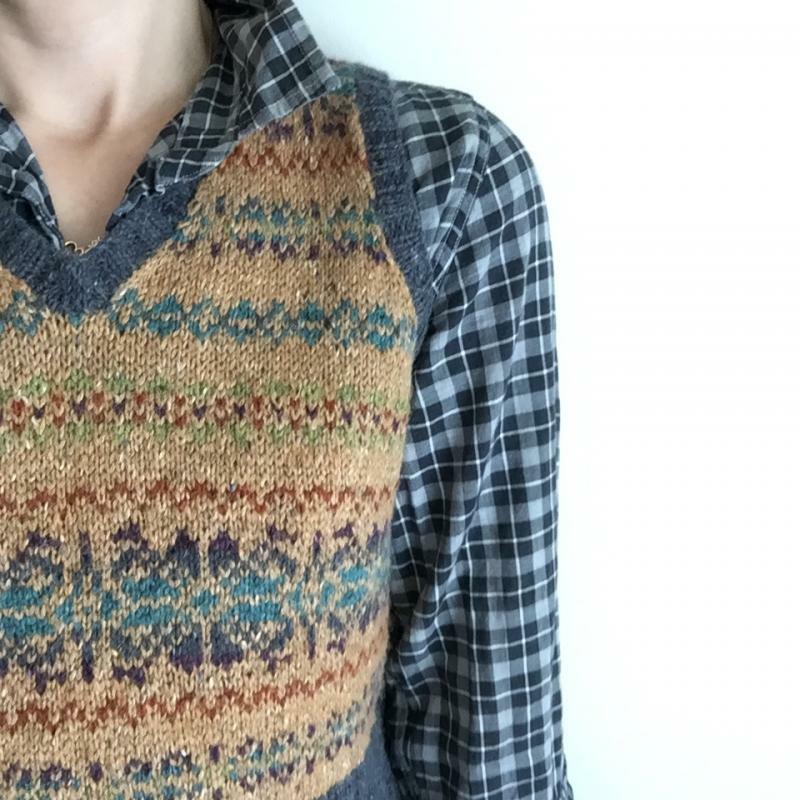 Beginning this month, we will be offering an unparalleled level of customized service to those wishing to make their knitting dreams a reality. We call it our Knitting Concierge service. 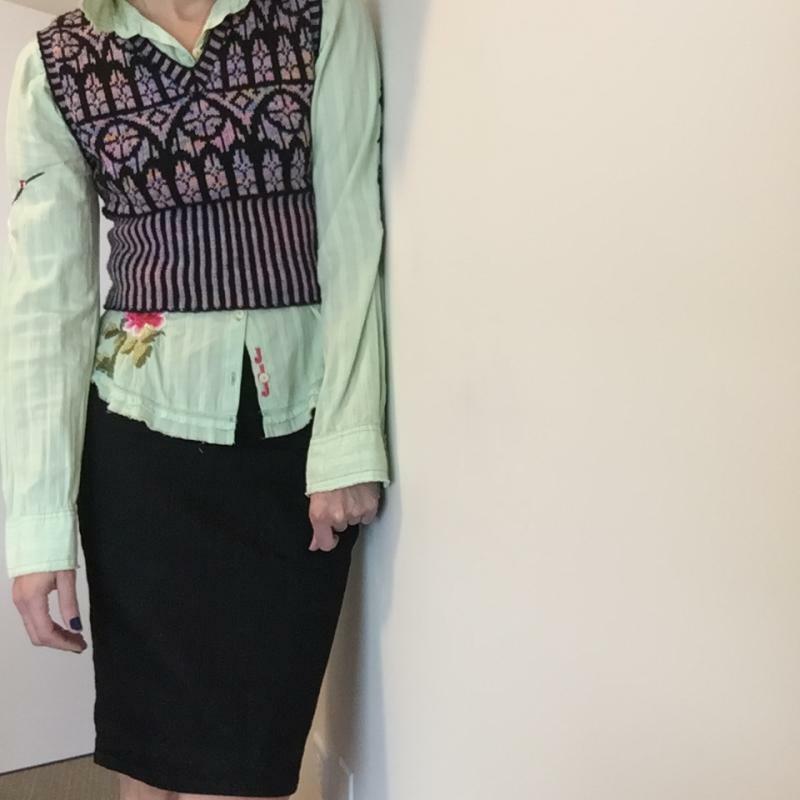 By special appointment, shop owner Kathy will personally assist you in reaching your customized knitting goals, be that learning to knit, mastering a specific skill, choosing an appropriate pattern or yarn, or styling a fashionable ensemble around your knitwear. Sessions at $35/hour can be booked for a variety of times on Sundays or Mondays downtown Chicago or on Tuesdays in the west suburbs or in the shop. We plan to offer online bookings shortly, but in the meantime, you can email us at office@knitche.com to set up your appointment. 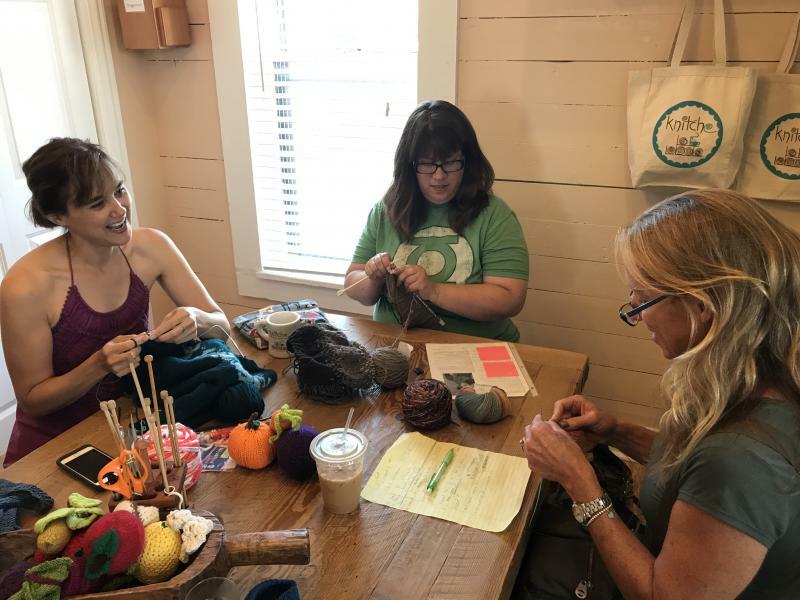 Join us at Skeleton Key Brewery in Woodridge for an evening of knitting, crocheting and beer drinking once monthly on Wednesdays from 6-8 pm. Bring your own project and enjoy some great drafts and good company. Check for future dates on the brewery's website. See you there! Art for Peace Initiative - Huge Thank You to All Who Participated! During the summer of 2016 Knitche, Inc. ran an Art for Peace Initiative against gun violence. The goal was to raise funds for programs assisting people living in Chicago's most violent neighborhoods and to increase awareness about the level of gun violence in our community at large. We developed patterns for knitted and crocheted guns and donated all proceeds from pattern sales (a total of $1500) to Chicago's Off The Street Club (www.offthestreetclub.com) OTSC, a long-standing organization that seeks to provide positive role models and make a difference in the lives of adolescents living in the Chicago neighborhoods most directly affected by gun violence. Guns crafted from these patterns (a total of 76) were then returned to the shop for inclusion in the public Art for Peace installation currently on display in our shop window. Why are you crafting guns? We are crafting these solely for inclusion in the art installation against gun violence. 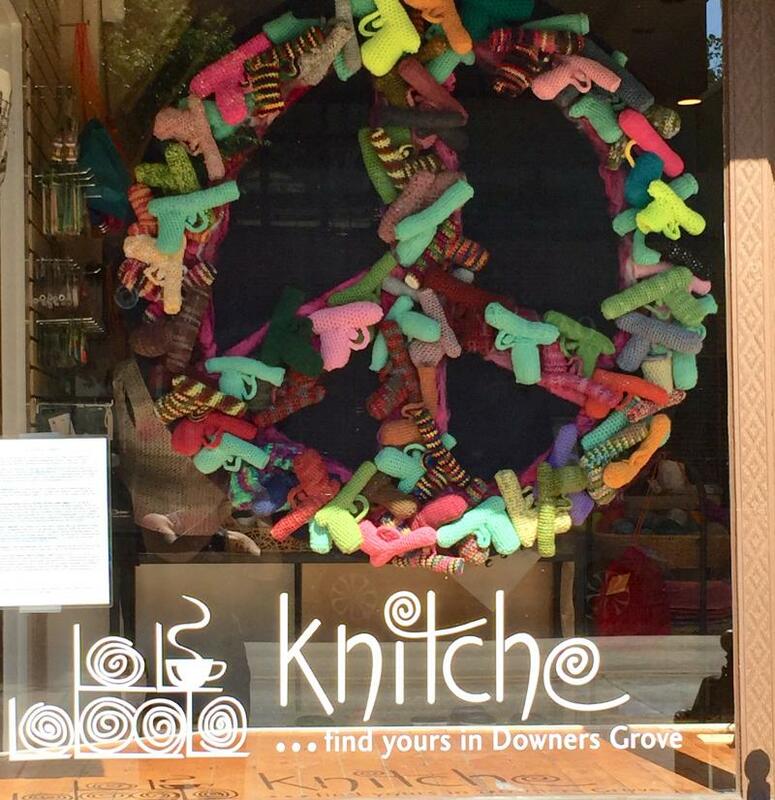 The knitted and crocheted guns are arranged in a collage in the formation of a peace symbol, for display in the Chicago area. The $10 pattern charge is a fundraiser for OTSC and is meant to deter any other use of the pattern. If you are protesting gun violence, why not craft items with more positive imagery? We feel that the juxtaposition of a gun (a cold, hard object that can cause such atrocities in the hands of people) with the soft, warm gentleness typically associated with knitting and crochet, will have a more powerful impact on the viewer regarding the specific topic of gun violence than say, a grouping of flowers or doves. 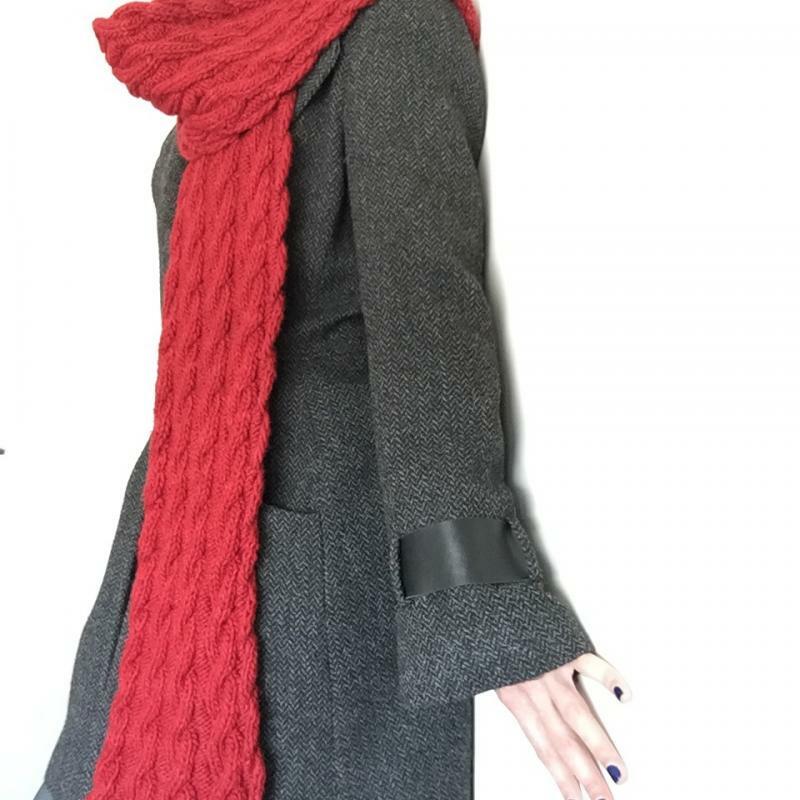 The very act of creating this object from yarn brings a unique awareness, with every stitch, of the disturbing reality of gun violence in our society. Additionally, the hand-crafting of these objects symbolizes the relationship of people with guns, the potentially destructive aspect both gun rights activists and anti-gun lobbyists recognize. Why is this issue so important? Gun violence in the United States in general, and in the metropolitan Chicago area in particular, is at staggeringly high levels. So far, shootings in Chicago are up 60% this year over last, making our city far more violent than both New York and Los Angeles combined despite being smaller in size than either one. There were 64 violent shootings reported in the city over the Memorial Day weekend alone (see http://www.nytimes.com/interactive/2016/06/04/us/chicago-shootings ). The Chicago Sun-Times recently estimated that there are 10 violent shootings daily in the city. Are you advocating for stricter gun control laws? This initiative is concerned with gun violence awareness and assisting those affected by this violence; we are not taking sides on any Second Amendment controversies. How can this Art for Peace initiative really do anything to help? By raising money for OTSC, we are supporting programs aimed at providing safe havens and positive inspiration to youth in areas directly afflicted with gun violence. The artwork we have created together will hopefully raise awareness about gun violence, the first step toward any positive change. Living in a world where we are constantly bombarded with devastation and sadness can provoke a sense of helplessness. Doing one small thing to make a positive difference is not only personally uplifting but, when combined with the efforts of others, can be a powerful instrument for change. 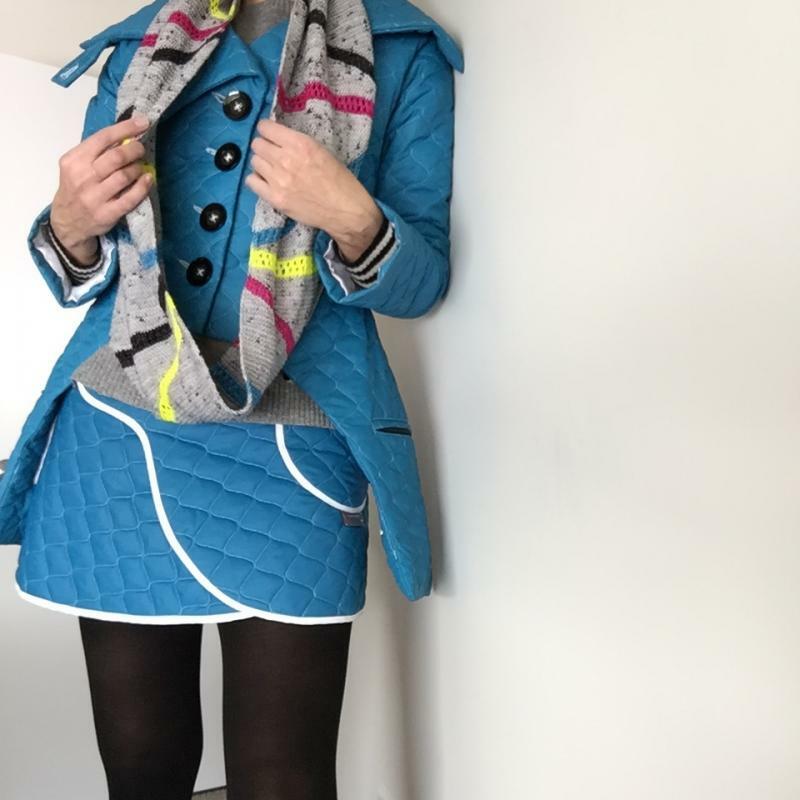 In January and February artist Linda Stucker created “C-60” to coincide with the Art is Community/Community is Art exhibition which was put on by The Art Department and was on display at The Downers Grove Historical Museum January 14th- February 23rd. 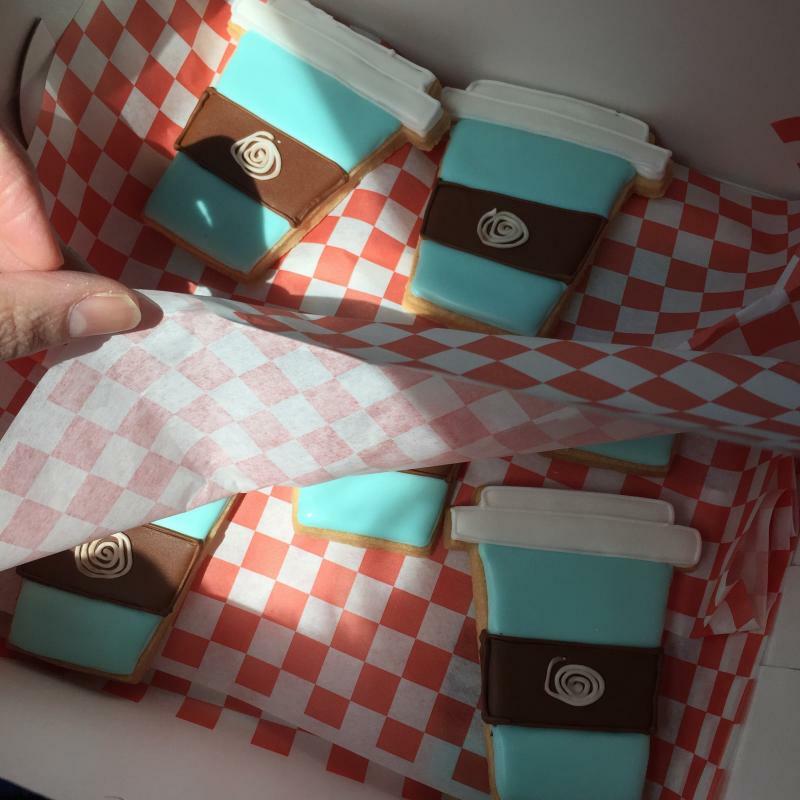 As part of a community-based art project, Linda invited Downers Grove residents to design their own 1 ½” mirror tiles to be included i﻿n the final work (Her process can be seen on The Art Department’s Facebook page). 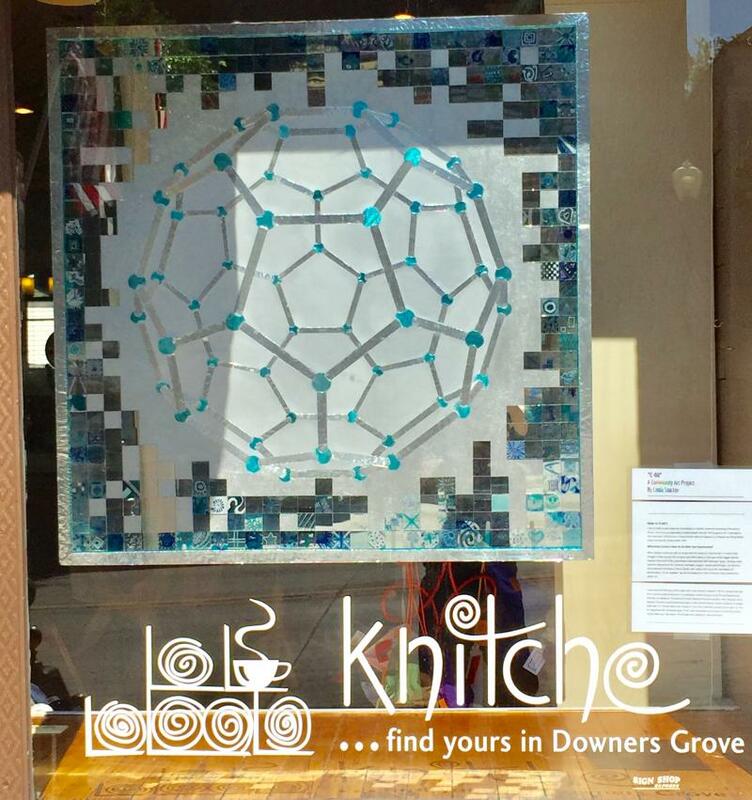 “C-60” was displayed at the Downers Grove Recreation Center February 14th-March 23rd before it’s installation here at Knitche. C-60, or what is also known as a buckyball, is a carbon molecule consisting of 60 carbon atoms. The structure resembles a hollow soccer ball with 20 hexagons and 12 pentagons. The molecule’s official name is buckminsterfullerene, because it is shaped like the geodesic dome invented by Buckminster Fuller. What Does Carbon Have To Do With Our Community? When trying to come up with an image with the theme of “community” in mind, Linda thought of the cosmos, the universe and what makes us all a part of the bigger picture. Carbon is the stuff of life. According to astrophysicist Neil DeGrasse Tyson, “the four most common elements in the universe- hydrogen, oxygen, carbon and nitrogen- are the four most common elements of life on Earth, with carbon serving as the foundation of biochemistry.” As he stresses, “we do not simply live in this universe. The universe lives within us”. 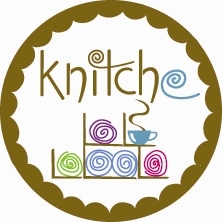 Knitche charity knitters meet once a month to support worthy causes near and far. 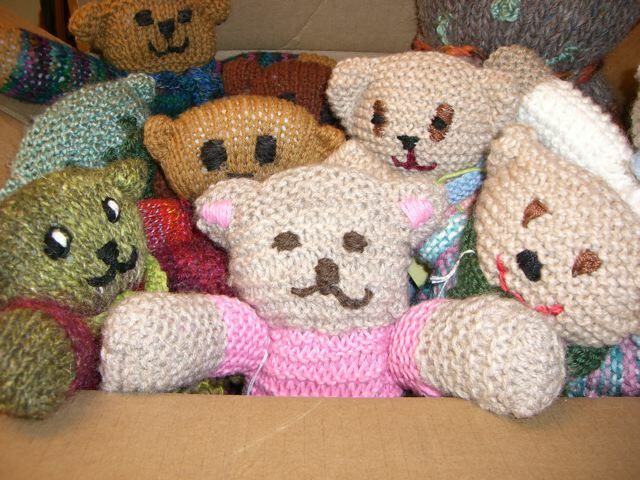 We gather on the se cond Thursday of the month to knit teddy bears for the Mother Bear Project, an organization providing a bit of comfort, in the form of a handmade teddy bear, to children affected by AIDS/HIV in emerging African countries. A nominal donation for the pattern subsidizes the shipping of each bear for this truly selfless cause. 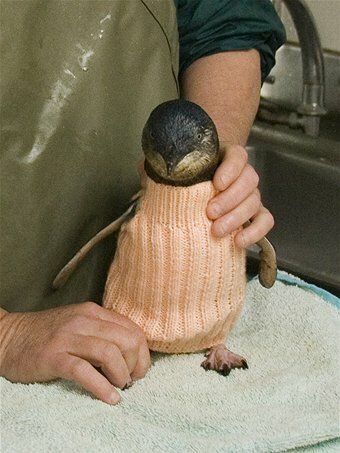 We are also knitting/crocheting blankets for the Project Linus Foundation as well as making "jumpers" for oil-soaked penguins for the Penguin Foundation. For more information on these efforts, please visit www.motherbearproject.org, www.projectlinus.org, and www.penguinfoundation.org. 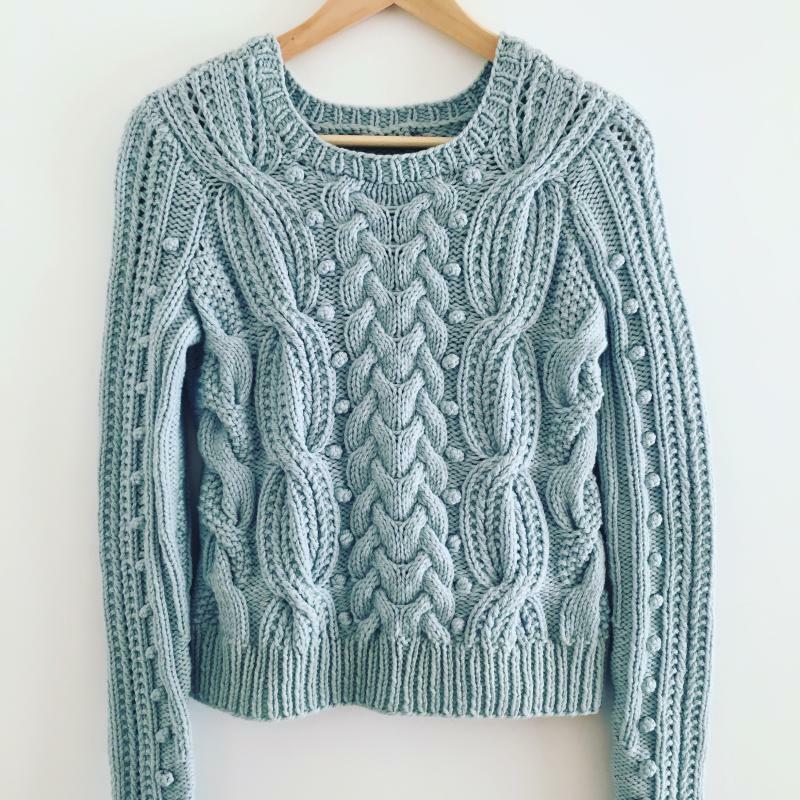 Thursdays (except second Thursday of the month which is devoted to Charity Knitting) from 7 - 9 pm Join our informal knitting circle for some stitching camaraderie. Please try to arrive as close to 7 pm as possible as this is when will be closing up our retail operation. We keep a rotating sale bin of yarns with savings of 40% off everyday. Select books and patterns are available at 35-50% savings everyday. Sale prices apply to in-store merchandise only (no special orders). All sales are final. 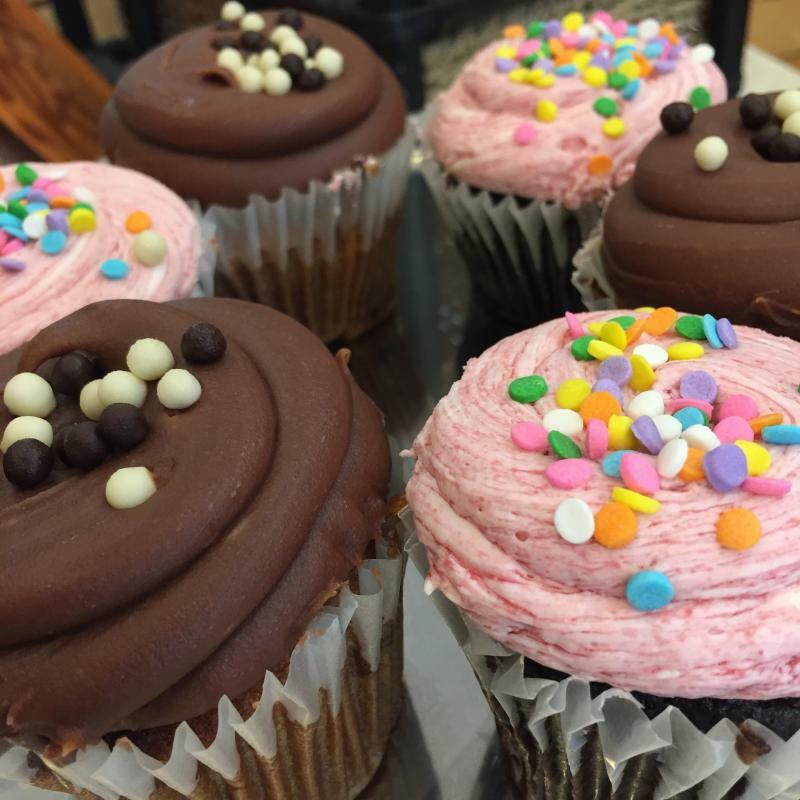 No price adjustment given for prior purchases. No Knitche Yarn Yearnings credit or additional promotional savings applicable for sale purchases.